My journey with Yoga began 14 years ago. Kyla Sorenne, from My Little Retreat, was my first long term teacher. Kyla’s love of teaching and deep understanding of the holistic practice of Yoga, was imparted to me during that period of time. Under Kyla’s tuition I also began to deepen my meditation practice and self-enquiry, and was introduced to Vipassana meditation. 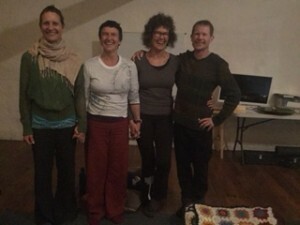 Kate Pell became my teacher when Kyla left Brisbane and my world shifted in many dimensions and perspectives. Kate’s beautiful approach to teaching Yoga ultimately allowed for deeper change to occur within myself, and enabled a deeper love for Yoga, and for life to evolve. Dan Alder has been and continues to be an influential teacher in my life. Enabling me the space to understand what is truly achievable in my practice both on and off the mat, Dan’s love of yoga and his self-enquiry are evolutionary and offer yet another dimension~perspective and reflection. I continue to learn and grow….teacher-student-teacher-student. As well as teaching Yoga I am a Holistic Nutritional and Herbal medicine practitioner. My practice is that of self-enquiry and the unfolding evolution of all that is. I try to stay as mindful and truthful to who I am in this moment in time as I can. My consultations incorporate holistic wellbeing practices to create space to begin to allow for change to occur. Creating peaceful cells, a nourished body, a quietening mind, a happy, joy filled life. This unfolding expansive journey that Yoga, in all of its elements, has gifted me, is the journey that I invite you to come and share with me in class, on the mat.